This adventure from Adventureaweek.com is 36 pages long, 1 page front cover, 1 page credits/ToC, 1 page SRD, leaving us with 33 pages of content, so let’s check this out! Hopefully, the PCs don’t dilly-dally, for the other two mites with their verminous mounts are in the process of torturing the dryad-ally of Oswald, while curing the skin of her sister. Finally reaching Oswald’s home, the PCs will have to brave another grizzly among the numerous beehives used by the druid to brew his favourite mead as well as a redcap, who drove the ursine mammals into such a frenzy. The lone survivor of the other adventuring group can also be found here – now, by her report (if they can get the drunken elven maid to talk) and by interacting with the surviving dryads, the PCs may find the location of the hidden grove where Daphne now lairs – guarded once again by a rather big pack of mountain wolves. Hopefully the PCs negotiate, for Daphne is no pushover either and curing the nymph will be quite a feat – possessed by a magical amulet that drives her paranoid, the PCs will have to be up to their game and make her helpful in order to get the amulet from her. So strong is the curse, though, that the nymph will try her best to regain it before 24 hours have elapsed and the curse is truly broken. All right, you know the drill – 1 page front cover, 1 page SRD, 1 page content, so let’s dive right in! 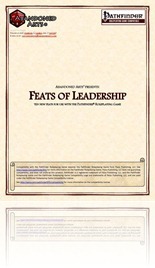 There are 10 feats of leadership herein, so what do they do? Authoritative: Followers + cohorts use your HD to determine whether they are affected by fear-effects and their intimidate DC. Competent Cohort: +2 to ability of choice for the cohort and further enhancements every 4 levels. Great Orator: After listening to your oration, followers and cohorts may later apply a +1 bonus to an ability or skill check, attack, initiative or saving throw. Incite Defiance: +1 to will saving throws and atk for you and your followers and cohorts vs. lawful opponents. Instill Obedience: The same one the other way round: +1 to will saving throws and atk for you and your followers and cohorts vs. _chaotic_ opponents. That’s how it’s supposed to work, but since the pdf suffers from a cut-copy-paste glitch, we instead get another bonus versus “lawful” creatures- FAIL. Redeemer: Attract followers on the other side of the alignment axis without incurring a penalty to the leadership score. Righteous Cause: Alleviate the penalty of a follower’s death with a gripping eulogy. Can’t be used too often. Nice one! Rule of Might: Use Str instead of Cha to determine leadership score. Cool! Team Spirit: Followers gain +4 to skill-checks using aid another to help each other. Zealous Performance: Your cohorts and followers gain slippery mind when affected by your performance. Wait. Grant a class-specific talent to multiple allies via a feat and as a side-effect of another buff??? No way! Editing and formatting are not top-notch: There is a lazy cut-copy-paste error here and honestly, at this length, that’s not something that should happen. Layout adheres to Abandoned Arts’ no-frills 2-column standard and comes sans bookmarks and artworks, but needs neither at this length. 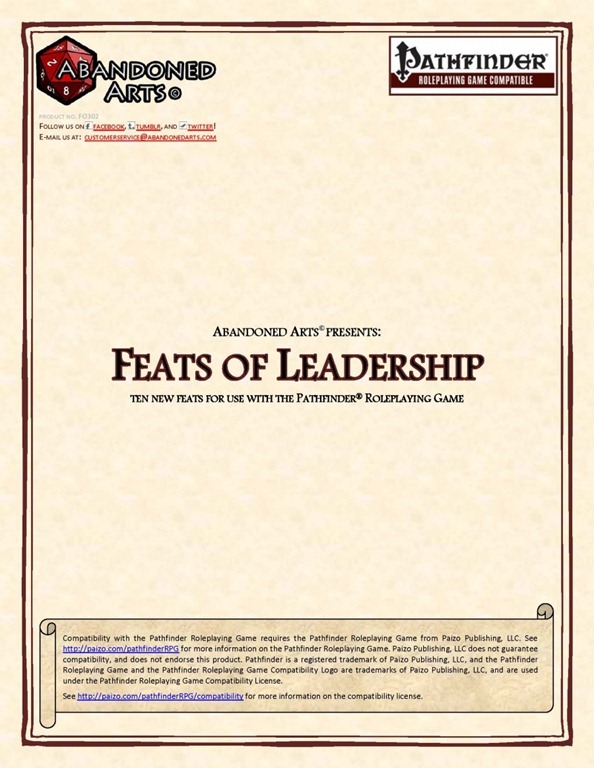 I’m a huge fan of the leadership feat and so are my players, but oh boy was I disappointed by this pdf. In contrast to SGG’s alternative versions of the leadership feat, this pdf has the aim to expand the benefits granted to followers and at least for me, it fails to do so. The supplemental character of followers and their relatively low level means that the PCs usually have some heavy buffing to do if they want to drag them into battle and, well, the feats herein honestly don’t help much, with bonuses granted ranging from paltry and simply not enough to being rather on the strong-side with the mass-endowment of slippery mind. On the fluffy side of feats, Redeemer and Righteous Cause make for good takes, though I also would have wished for them to have more significant repercussions rules-wise: Righteous Cause works via a Charisma-check and honestly, it feels more like a skill-check to me: A table or something like that would have gone a long way to make that on better. Competent Cohort is an interesting feat and a good way to go, but honestly, in the end most of the feats herein felt to me rather uninspired, boring or balance-wise not exactly all hunky-dory. Since the amount of good ideas herein is rather small, the overall use of this pdf to respective leaders should be not to significant. In the end, I’ll thus settle for a final verdict of 2 stars. This pdf from Run Amok Gamesis 87 pages long, 1 page front cover, 1 page editorial, 1 page ToC, 1 page SRD, leaving a total of 83 pages of content, so let’s check this out! We’ve all been there. There’s this awesome module we’re playing in. The adventure works just fine. And then – boom! A cruel twist of fate. A bad roll of the dice. A critical hit to head with a scythe. A ton of rocks on the head. A sewer-gas explosion. An assassin’s knife to the back. Damn. Resurrection is not an option, either due to circumstances of the death, the campaign setting or group finances. It’s off to character creation again. Only: You don’t have a character in reserve. But damn, you want to play! Or perhaps a friend who moved away is in town and wants to roll dem bones again, but has no character ready. This is where this book comes in, providing a selection of a total of 13 different NPCs. It is noticeable from the get-go that each character comes with a mug-shot in b/w as well as full stats and gear. A sidebox also details traits, wealth by level and increased point-buy-options for the respective characters – each one of them, thus enabling you to potentially modify them on the fly and already taking the tedious starting-treasure-selection off your chest, if you’re so inclined, that is. Now, each of the potential PCs herein comes with short information on appearance, personality and behaviour in combat as well as enough space on the page for hit points, conditions and modifiers as well as general notes, cramming the full stats of the character on one page without making it feel bloated – probably thanks to the concise and easily navigated presentation. It should be noted though, that due to the length of higher level statblocks, the respective higher-level incarnations have less room for notes (or none at all), conditions etc. on the page necessitating an additional piece of paper. Furthermore, each of the characters comes with a suggested way of getting them into action right now via teleportation mishaps, proximity etc. What higher level incarnations? Well, to maximize usability, each of the characters presented herein comes in 4 different versions: One at level 1, one at level 3, one at level 6 and one at level 9. So, what kind of characters do we get? We get Aleksandros, a zealous human battle oracle, Adeniel, an elven witch (who in the revised version ow includes stats for her fox familiar for all levels) and Caffey, a human urban ranger (with information on adding the skirmisher archetype. The archetype-information is cool and I wish each of the characters would come with one, but formatting-wise, it’s a problematic: You only have to print out one page per character to use them, that’s the layout’s goal – and it succeeds. However, to preserve this unity of presentation, the information for on the fly appliance of the archetype is presented on its own page – almost lost amidst a lot of white space that could have at least been filled with more boxes for notes. The dwarven cleric Foscrim also suffers from this, providing information on 3 variant alignments and respective domain spells in a similar manner – which is doubly a pity since he comes with an intelligent phylactery of faithfulness at higher levels (with full stats) that would have made an excellent legendary item that scales with his levels. All those advocates of weird races and feline friends will enjoy Janakath, a noble catfolk paladin that comes with full information on how to change the noble warrior alternatively into an antipaladin. Lat Keth, a half-orc monk is another rather interesting character, as he comes with a vow of poverty that utilizes an interesting idea: Essentially, he has built-in bonuses AS IF he owned level-appropriate gear due to his vow, but they can’t be stolen and stack with spells. However, he may not use respective items and gear. I’m not sure I’m sold on this particular one, since the bad memories of the Book of Exalted Deed’s utterly broken poverty-mechanics still linger in my mind. I simply did not have the time yet to properly judge the repercussions in game of this approach to the vow and thus can’t fairly comment on whether the approach is balanced or not. What I can, though, is advise DMs on working with potential players of Lat Keth and make sure that the limitations imposed on the character by the vow are strictly enforced. Half-elven Arcane Duelist Bard Lhostra Dragonblood makes for an interesting character especially for players all into draconic heritage etc., especially if her alternate progression is taken: At 6th and 9th level, she has multi-classed into the dragon disciple PrC and may actually have a forest drake cohort, for which we also get full stats (though also half a page of blank space). A more straight-forward gish than Lhostra then would be Osmer, a tiefling magus who also comes with rules to balance the tiefling-race in a low-powered group vs. the other races as well as information on making a scarred half-orc out of him. Quorena, an elven fighter, is the obligatory eleven archer with a secondary focus on melee and comes with full information on flipping the focus from ranged combat to melee. Speaking of iconic roles bordering on cliché: Of course, there’s also a halfling rogue, one named Tedric. His level 9 build can be changed to rogue 6/assassin 3 and honestly – his dashing mug-shot makes him look badass -cool! Speaking of badass: Thura Thunderbirnger, a dwarven gunslinger with a Vampire Hunter D-hat can also be changed into a human pirate via the information contained herein. Vinkia, halfling druid, also is rather interesting: The druid comes with full stats of her juvenile roc animal companion from the starts as well as information for replacing the roc with the animal domain. In a n act of sheer brilliance, the juvenile roc not only is presented with full stats for all levels, we also get TWO versions of the character’s presentation – one with all stats lumped together on one page and one that seperates the presentation of the animal companion’s stats and that of Vinkia – a great and awesome way of ensuring that whatever your taste is, the pdf delivers. I wish all companies would do something like this in respective publications.The final new character introduced would be Zarastar, Gnome Sorceror with a celestial bloodline and his trusted signature summon, Blinky: A celestial dire bat that comes with full stats. Blinky is awesome. My players probably would love the critter as much as Misk’s Boo. And in the revised version, Blinky is supplemented by another signature summon for lower levels, Filbert, the friendly celestial eagle. Awesome! Editing is top-notch, I didn’t notice any glitches. Formatting, though, is a slightly troubled subject, at least for me: First of all, I really like the ambition to get all the stats on one page for maximized usability. However, the lack of space for notes etc. on higher-level versions of the characters slightly impedes the otherwise stellar usability. Layout adheres generally to a 1-column, landscapeish presentation of the fluff next to the portrait of the character, clearly separated from the mostly 2-column-presentation of the crunch. Layout per se is printer-friendly b/w with corresponding artworks that can be considered nice and run the gamut from awesome to slightly goofy. The pdf comes fully bookmarked and now comes with nested bookmarks that make navigating the file much simpler – again: Kudos for listening and quickly improving! There’s unfortunately still an extremely annoying formatting peculiarity that resurfaced for me with Adobe Reader X: While perfectly readable in print, it takes some configuration to properly display the text, otherwise you’ll see certain letters and combinations of letters as bold. I usually wouldn’t complain about that, but since Adobe is still the assumed default, I figure the problem should be addressed sooner or later by using another variant of the font. This collection of characters is very useful for its intended purpose and would also make for a good starting ground for DMs who want a rival NPC-group sans work – just take some of these guys and gals and there you go. It’s also a slight pity that we don’t get a sample inquisitor or a sample summoner. 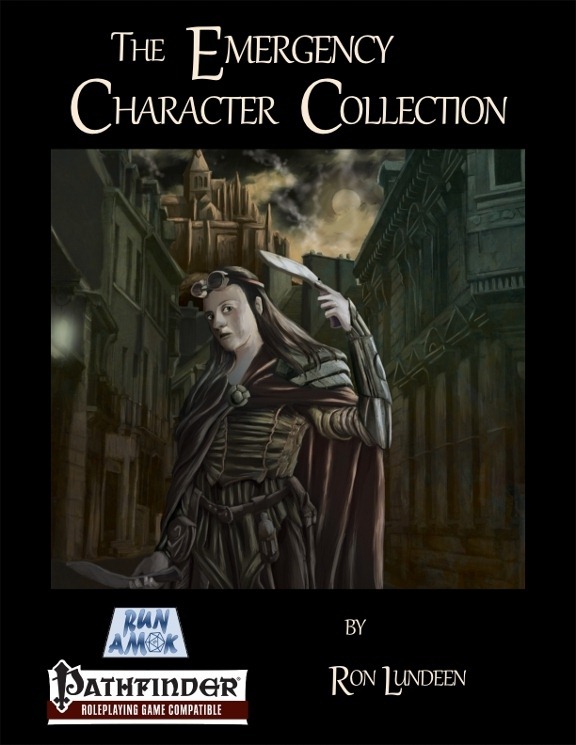 I am honestly blown away by how much this revised edition of the emergency character collection has improved – from bookmarks to actually MORE content to the fact that we now may even choose between two layouts regarding a character that has more crunch information than the other, this pdf has improved significantly – enough to bump my final verdict up by an additional star and clock in at 4.5 stars – there still are some minor issues like the font-glitch in adobe, but content-wise, almost all minor issues I had with this collection have been eliminated. While falling slightly short of 5 stars and having minor room for improvements, I am confident that Run Amok Games will make Vol.II, if it ever comes out, a true joy to behold. For now, I’ll round down to 4 stars for the purpose of this platform. This pdf from Raging Swan Pressis 13 pages long, 1 page front cover, 1 page advertisement, 2 pages editorial, 1 page ToC/foreword, 1 page SRD and 1 page back cover, leaving us with 6 pages for content, so let’s check this out! This pdf, much like the others in the excellent Dungeon Dressing-series, kicks off with a discussion of the object-class at hand, to be more precise, about component materials and pre-calculated HPs, breaking DCs as well as notes on construction before we delve into a table that provides us with a total of 31 different characteristic appearances that include being part of brass reliefs, being covered with programmed images and even featuring an arrow slit. Where applicable, the entries also features all necessary rules for e.g. arrow slits etc., making these additions work as seamlessly as your secret door’s hopefully hidden. 75 entries are provided for dressings and features – from a human corpse pinned to the wall with a spear to airtight secret doors that have a bull rush of air erupt when opened to cosmetic features like perfume, old paint denoting the door’s existence. Among my favourite ones would be a secret door that is covered in plaster depicting two lovers, literally ripping the plaster (and thus the lovers) apart when opening the doors. Nice symbolism that can easily be used by a bright DM. Of course, there also are 6 traps to secure secret doors, including a door-mounted crossbow, buckets of acid (in a cruel twist of the traditional prank) and a rather devious one that actually arms a second trap when disabling an obvious one. Other devious traps combine poison gas with clever illusions, doors that slam you against the wall and a teleport splitter. The traps range from CR 1 to 9. Editing and formatting are very good, though not perfect: The second table features two entries for the number “3”, omitting the 4. Layout adheres to Raging Swan Press’ elegant b/w-2-column, no-frills standard and comes with full bookmarks as well as two versions, one optimized for screen-use and one to be printed out. The Dungeon Dressing-series is usually a joy to review: Nice content, consistently high quality and high usefulness for any DM and this issue is no different in that regard, providing us with cool dressing and tricks to spice up our secret doors – just don’t get carried away like the designers of Ultima IX’s Castle British. 😉 Kidding aside, another great installment and thus I’ll settle for a final verdict of 5 stars, only omitting my seal of approval due to the one glitch and the fact that I would have liked a longer table on secret door appearances. This pdf from Raging Swan Pressis 13 pages long, 1 page front cover, 1 page advertisement, 2 pages editorial, 1 page ToC/foreword, 1 page SRD and 1 page back cover, leaving us with6 pages for content, so let’s check this out! Like with all Dungeon Dressing-pdfs, this one kicks off with characteristics and appearances, in the case of corpses, states of decomposition – from fresh to bloated, from dry to preserved, two pages are devoted to stench-DCs, DCs to determine the causes of death, the time since death, intimidate-DCs and even feature DCs to prepare them for consumption by humanoids – disturbing, cool – awesome. In all Dungeon Dressings so far, this is my favourite section A, especially when taking into account how the information could be used to add flavour to undead foes as well! The second table in here is devoted to 20 monster-carcasses and remains general, thus featuring no individual monster properties. Instead, we get e.g. one entry that provides information based on type, e.g. putting an aberration into a state of regenerative metamorphosis or putting a living baby in the body of animals, magical beasts or vermin. Again, very cool! Table C provides us with 50 generic properties for humanoid corpses that range from being hairless to tattooed passphrases and even a spell engraved in eldritch symbols into the skin of the dead, complete with DCs to recognize the diagrams for what they are. Beyond generic humanoids, we also get 6 corpses of adventurers with all information from chapter A applied for a kind of corpse statblock (very cool!) as well as suggestions for speaking with the respective dead or for raising the person in question. As with all instalments of Dungeon Dressing, the final section (this time just one page, though, as the rest took up more space) is devoted to traps, this time around ranging from CR: – to CR 10 and feature a fountain of holy water that ends undead, a collection of impaled dead and an avalanche of cadavers. Rather cool! Though I would have loved to see either more traps or some haunts, the lack thereof does not hurt this pdf. Editing and formatting, as almost always with raging Swan press, are top-notch: I didn’t notice any glitches. Layout adheres to RSP’s elegant printer-friendly two-column standard and the pdf comes in a screen-version and a printer-friendly version, both of which are fully bookmarked. Wow! 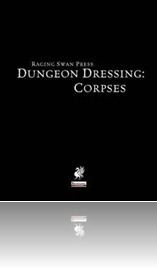 Even in the excellent Dungeon Dressing-line, this pdf goes above and beyond by providing easily usable rules for nasty corpses (especially cool if your campaign’s like mine and features a lot of investigation and thus also autopsies) along the extremely usable tables. I feared initially the pdf would either provide too specific corpses (rendering most impractical/hard to use) or too generic (rendering the content bland). I’m happy to inform you that author David Posener not only managed to maintain the precarious balance between both, but gracefully succeeds at the task, much to my (metaphoric) applause – this is, at least for me, the best installment in the excellent line and a joy to behold. 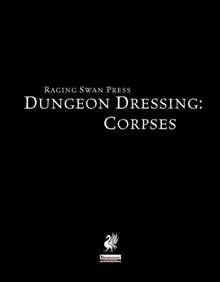 Even if you usually don’t like/need the dungeon dressing-line, I wholeheartedly encourage you to check this out – it’s that good and the corpse-stats, albeit simple, alone are worth the low price of admission. Final verdict? Nor surprising! 5 stars + seal of approval! This module from Adventureaweek.com is 79 pages long, 1 page editorial, 1 page front cover, 1 page ToC, 2 pages SRD, leaving us with 74 pages of content – quite a bunch, so let’s check this out! All right, still here? The PCs in this module enter the town of Prince’s Folly as guards of a caravan, bringing supplies to the prosperous town of Prince’s Folly – a model of wealth and efficiency, overseen by the McDonegal family from their cliffside mansion – only that from the very first glimpse, the place turns out to be anything but idyllic, providing an almost apocalyptic vista which is further solidified by the first challenge the PCs will face: A throng of famished villagers running accross the vitality-drained desolation to the caravan in dire need of food and water. Hopefully, the PCs can distribute food fast enough to prevent an escalation and unnecessary deaths that will result when forcing the town’s militia to intervene. Worse: Some of the town bravos have decided that the McDonegals should pay and try to ride up the funicular that represents the only regular access to the mansion, potentially resulting in a interesting battle on the funicular. The problems in the town are massive indeed – the old well, for example is not by chance now lethal – the old well is now home to a black pudding. 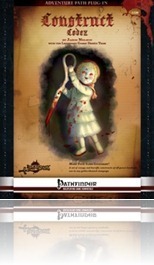 They may also encounter a rebellious scion of house Donegal with a coin that can purify a limited amount of water and purge it of the lethal plague that besets the town or the guise of the McDonegal’s messenger of death, the local river banshee, who is washing the prince’s jacket, which is stained with blood. By foreshadowing and encounters, there are a lot of options to point the PCs towards McDonegal mansion and towards the necessity of uncovering what exactly is the reason for the village’s blight. Finally reaching the manor grounds, the PCs are in for rather interesting sights – An old woman slashing her arm (the other guise of the banshee), turning the river’s waters as black as the blood dripping into the water. A second example would be the manor’s gardens, which consist of a gamut of potentially lethal carnivorous plants that have been domesticated and heed the call of the Leprechaun gardener – who turns out to not be a killer, but actually a pleasant fellow who provided the water purifying coin to young rebellious Cara Donegal. Hopefully, they are friendly to the mischievous fey, for the garden conceals one of the entrances to the dungeon, into which the plague victims have been thrown – bloody bones, ghoul wolves, giant boring beetles and finally, a gallows tree will challenge their mettle when they explore the dungeon. Have I mentioned the behir? Lost in the dungeon lies a comb of a young maiden, one Eluiwaue’s, who was the banshee when she was among the living. Prince Elian, who had a tryst with the peasant girl, killed her and threw her body in the river, thus creating the keening spirit that is ruining the town. When the PCs take the comb, they are transported back through time and can prevent said act of murder, assist it or prevent at least the rage demon transforming the poor wench into an undead spirit of vengeance. Editing and formatting are very good, though not perfect. I noticed some minor glitches here and there, but none too significant. Layout adheres to the 2-column parchment-background style and the cartography is top-notch (4 maps, which also come as player-maps sans map-keys). The pdf comes with a printer-friendly version and herolab-files (which by the writing of this review have not yet been added, but will be asap). The pdf also has nested, extensive bookmarks. This is an interesting module in that we don’t see that many of this kind around anymore. While having a clear beginning, the module is a sandbox in the truest style – the locations are provided alongside the symbolism that should help the players decipher what has truly happened. The NPCs are there, but how confrontations, encounters etc. play out is up to the DM, as is whether the players will have to get a confession from the true culprit, change the past, simply slay the culprit or vanquish the undead spirit besieging the town. 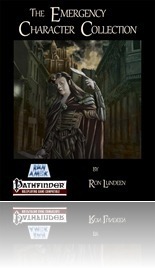 Everything is possible and whether you play this as an action-filled romp, a fast-paced series of combats or instead would enjoy a slow investigation in a desolate area – this module accommodates all of these play-styles and more while harkening back to a very old-school type of feeling and atmosphere…and I love it. Yes, this module requires you as a DM to do some work (though not much) and make it your own – but it works like this in a great way and offers you nice ways to customize the individual experience of running through it. In 5 minutes I had determined how I would connect the dots, items etc. to craft a slightly more complex intrigue/aim and determined that the players would have to actually find evidence/confessions etc. and had a grin on my face. An iconic locale, a cool sandbox and battles/foes that are a joy to behold – all in all, a great module that falls only short of my seal of approval due to one fact: I would have liked more (and less obvious) clues to unearth, more guidelines for example how the McDonegals receive the players/power-structure in the village etc. -again, something you can do yourself, but it would have been the icing on the cake. 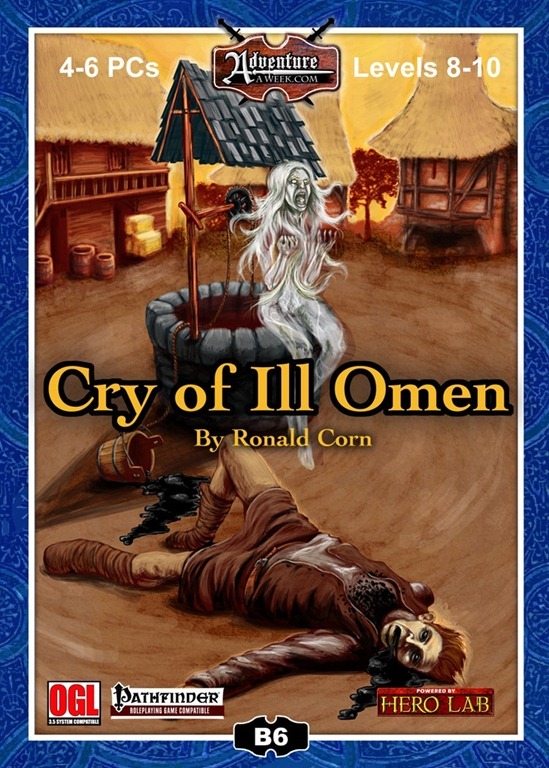 Congratulations to author Ronald Corn! This pdf from Abandoned Arts is 5 pages long, 1 page front cover, 1 page SRD, leaving us with 3 pages of content, so let’s check this out! This pdf kicks off by providing us with 4 new curses for your oracle: The first being amnesiac, which makes you susceptible to mind-affecting effects, but hardened vs. other magic and resulting in remembering feats at higher levels. The second curse marks you as damned, which makes others react negatively to the taint of your doomed soul and adds some spells to the oracle’s spell-list. The third curse is the curse of the idiot-savant, which reduces your int by 4 point and makes it impossible for you to make skill-checks based on the 3 mental attributes untrained. However, you use your wis-modifier instead of int to determine your skills per level and to use Knowledge and linguistics. At higher levels, an oracle with this curse may take 10 in chosen skills even when under duress. The final curse strikes you with a chronic illness that reduces your life expectancy and are susceptible to diseases, but hardened against other fortitude-effects and learn to remove diseases from others. Beyond these curses, we are also introduced to two new mysteries and their associated 10 revelations, the first being the Mystery of Dreams, which grants you the option to retry failed knowledge-checks by sleeping over it, may act normally while sleeping (but under the staggered condition) by sleepwalking, remain alert while sleeping and conjure forth your dreams as creatures and even the hallucinatory terrain of your dreams. Neat! The second mystery and its 10 associated revelations are all devoted to the theme of riddles, allowing you to pose curse-laden riddles (mechanics are given, but if you want to roleplay it – Raging Swan has just released “So what’s that Riddle like, anyways?” for a rather affordable price) and use a rather cool ability: By contemplating the divine conundrums of the universe for a minute, you can take 20 on a single knowledge-check or retry a failed knowledge check, but at the cost of 1d4 points of Int-damage due to the mind-boggling nature of the things you contemplate. The Mnemonic concentration is another cool ability, allowing you to cast a lower level spell as a reaction to failing a concentration check to cast a spell as long as your initial concentration result would allow you to cast that one. Interesting indeed! As is the riddler-style ability to ask your enemies riddles and gains scaling bonuses as long as they fail to answer your riddles. I LOVE this mystery and its associated revelations – it’s just so full of awesome roleplaying potential! Editing and formatting are top-notch – I didn’t notice any glitches. Layout adheres to Abandoned Art’s 2-column, no-frills standard and the pdf comes with neither bookmarks, nor artworks, but needs none at this length and price-point. All right – the curses are neat with especially the idiot-savant being rife with roleplaying potential and something I’d definitely love to play! The dream-mystery is the so far best take on the topic and the riddle-mystery with its associated revelations is just plain, utter, brilliant win and makes up for the minor dislike I have against the rather bland amnesiac curse and the very bland damned curse. In the end, this pdf is a very good file that simply does not deserve being graded down – especially since my problems with the aforementioned contents are based on personal preference and not on mechanical gripes. Thus, my final verdict will be 4.5 stars, rounded up to 5 for the purpose of this platform – the riddle mystery + revelations alone are worth the price of admission. 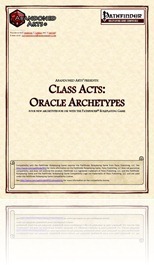 This pdf from Abandoned Arts is 4 pages long, 1 page front cover, 1 page SRD, leaving us with 2 pages for the new oracle archetypes, so let’s check these out! The first archetype, the doomsayer, gains access to intimidate as a class-skill and replace their first level revelation with the option to demoralize foes as a move action and at 7th level demoralize foes adjacent to shaken, frightened or panicked beings in exchange for yet another revelation. Ok, I guess, but mechanically oh so bland. The second archetype, the Haruspex, replaces the revelation at 1st and 11th level for a hex and grand hex respectively as well as ritualistically disembowel a creature and read the future from its entrails – cool replacement for the 7th level revelation and an overall short, but sweet sword & sorcery-style archetype that would also make for a cool way to highlight sinister oracles or those from primitive cultures. The third archetype is the Indwelling, which features a rather complex mechanic with the indwelling spirit: Replacing the oracles curse by being entwined with a spirit, the oracle becomes susceptible to outsider-targeting spells like banishment (which deals damage) and circles of protection, but also opens her eyes for the spiritual, becoming not only more aware and able to cast guidance at will, but also granting true seeing at higher levels. Also, at 1st level they must take the new two minds-revelation for a bonus of +2 to will-saves versus enchantments and later even a reroll to represent the dual minds and at 3rd level, you can treat your str-score as if it was your cha-score for a round. The latter revelation can be used more often at higher levels. The final new archetype is the Oracular Opiate, suffering from the curse of addiction to a drug and only having access to mystery bonus-spells while drugged as well as gaining a +4 bonus to disbelieving illusions and the option to exhale a haze of hallucinogenic vapors into adjacent squares. This is actually the best take on the concept I’ve seen so far and should also make for an interesting option to play. Editing and formatting are top-notch, I didn’t notice any glitches. Layout adheres to Abandoned Arts’ 2-column, no-frills standard and the pdf has neither bookmarks, nor artworks, but needs none at this length. All right, the Doomsayer is bland in my opinion – the mechanics have been done before and in more interesting ways. Thankfully, the same cannot be said about the other 3 archetypes, which all serve their niches surprisingly well, have one or two neat signature abilities that set them apart and should work as nice character concepts. Also, I universally would have wished for all of them to be longer and more complex – seriously, that’s usually a good sign, especially when I don’t ask for more length due to a bad bang-for-buck ratio. Indeed, while short, the archetypes herein work nicely and for a buck, they are a valid and good purchase, though still one I would have wished to be longer. Thus, my final verdict will clock in as 4.5 stars, rounded down to 4 because with just one more page, all archetypes could have been developed further to the point of utter, mind-boggling awesomeness. This pdf from Abandoned Arts is 4 pages long, 1 page front cover, 1 page SRD, leaving us with 2 pages of content, so let’s check this out! The first archetype herein is the ascetic athlete, who gains double the endurance bonus and later diehard as well as fast healing 1 when under 0 HP, making him REALLY hard to keep down. When threatening an AoO through movement, they may also deflect said attack similar to the Deflect Arrow-feat, may use ki to have str-checks count as 20s and gain fast healing, purge poisons at higher levels from his system and finally at 20th level even deflect all AoOs as with the feat. Cool archetype indeed – nothing to complain, two thumbs up! The second archetype herein is the Oblivion Disciple: Oblivion Disciplines may enter a state of an empty mind, losing access to flurry of blows, high jump, and fast movement, but double the still-mind-bonus and become immune to emotion, fear, morale and pain effects as well as the confused, nauseated and sickened conditions, even suppressing pre-existing effects while in this meditative stats. While in this state, they may also spend 1 ki 1/round to gain a +4 bonus to atk. Beyond combat monks can even sustain themselves in this state. This state replaces the stunning fist power. As further balancing factors, though, Purity of Body, Diamond Body and Empty Body now only work when tied to this state. Furthermore, at higher levels Oblivion Disciples gain a non-detection effect while in the state and at higher levels they can make frightening gaze attacks and 1/day, actually DISINTEGRATE a shaken, frightened or panicked foe! Hell yeah! Further high level abilities include true strike 1/day and outsiders transcendence. Editing and formatting are top-notch, I didn’t notice any glitches. Layout adheres to Abandoned Art’s 2-column no-frills standard and the pdf has no bookmarks, but needs none at this length. I’ll make this short: The two archetypes herein are stellar in design, sufficiently complex, provide enough distinctive abilities to make them feel different from the standard monk and are not only well-crafted, but actually have really neat signature tricks up their sleeves – for less than a buck! Two thumbs up – final verdict: 5 stars + endzeitgeist seal of approval.